The British porcelain industry was born out of a passionate desire to imitate and compete with Chinese porcelain, already a well-established industry when John Sandon’s book picks up the story in the mid-17th century. Chinese porcelain was exported to Britain by the East India Company and was highly accomplished and very fashionable, appearing on the tables and in the display cabinets of the British (and European) upper classes. A solution was needed, and all over Europe ceramicists worked feverishly to discover the secret of this wondrous white, translucent and strong ceramic. John Sandon’s book British Porcelain tells the story of the development of the British porcelain industry from the mid-17th century until the present day. The author is a leading expert on European porcelain and will be familiar to many readers from the Antiques Roadshow. In his day job, he is International Director for European Ceramics and Glass at Bonhams auctioneers in London, where he has worked for more than 30 years. John Sandon’s enthusiastic prose is accompanied by a great many wonderful photographs and this book is a pleasure to browse or read. The author’s genuine passion for porcelain is obvious and the book provides a fascinating tour through the names, styles, factories and occasional calamities of 250 years of British porcelain production. 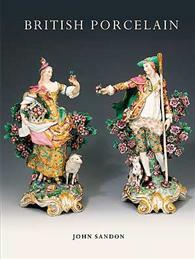 British Porcelain makes an ideal introduction to the subject for anyone who would like to start collecting British porcelain or would simply like to know more about the subject. It enables you to understand the historical context of different factories, designs and forms of decoration and to gain an appreciation of the choices that are available to collectors in this area. You can purchase British Porcelain by John Sandon on Amazon or direct from the publisher. This entry was posted in Reviews and tagged British porcelain, John Sandon, Shire Books on November 18, 2010 by Perfect Pieces.